On a somewhat fortuitous lunch-time hunt, in addition to a couple other nice scores, my local store had also just received a shipment of the Willett Family Estate 2-year ryes. I've previously had the 8-year rye, which was sourced from MGP. 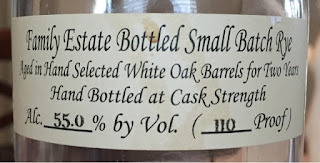 As a commenter in that post correctly pointed out, Willett only recently began distilling their own rye, and their own product is accordingly only two years old, and more recently three years. As incredible as that 8-year was, I couldn't wait to try out the 2-year and taste the fruits of Willett's labors. Immediately upon opening I was smacked in the face with the aroma of this rye. It has a very bold, sweet nose that smells amazing. It was tough to put my finger on but could best be described as caramel and coffee, like a macchiato. It was a strong, yet wonderful scent that had my mouth watering in anticipation of that first sip. Although the palate didn't necessarily match the nose, it was nonetheless just as yummy. I did find this rye to be somewhat unique in its flavor, though. It tasted like a warm apple Danish or a bear claw. Though not overwhelming, I couldn't help but notice a persistent apple cider flavor, along with cinnamon and brown sugar. This really was dessert whiskey, or perhaps even a breakfast whiskey for those who like their sweets in the morning! 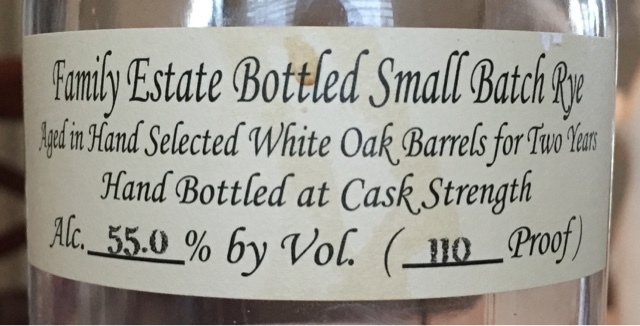 Despite being a high-proof rye, clocking in at 110 proof, it seemed to have almost no burn. It had just enough spice at the end to help warm me up, but make no mistake, this is predominantly a sweet rye. It also came across as a very complex rye, aided, I'm sure, by the fact that it's barrel proof. As I worked through this bottle, other flavors developed. I detected a bit of anise and maple, and the coffee notes that I noticed initially in the nose began to permeate. Surprisingly, it seemed to get even sweeter, but never too sweet, as it was always more of a brown sugar sweetness that was at all times balanced just enough by the rye spice, like good, spicy hard candy. Word on the streets is the 3-year rye will be making its way across the country this January. Should I come across one, I won't hesitate a second to buy it, because the 2-year was incredible. Enjoy your blog! Be awesome if you noted the price per bottle. Keep up the good work! Thanks for the kind words and the feedback! I frequently do allude to value, though I rarely expressly state the cost--can't let my wife to know how much I'm spending on whiskey! :). I certainly can do so going forward, though! As to this one, I paid $40.